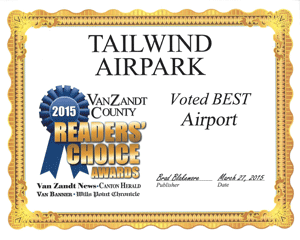 Tailwind Airpark began development in 1997 as an aviation oriented community where folks could live peacefully and enjoy aviation with fellow neighbors without the hassles of busy metropolitan life and congested airspace. Tailwind Airpark is located 60 miles east of Dallas, TX, 2 miles North of I-20 near Canton, TX, a quiet East Texas town of 3,581. So if you like country living and aviators for neighbors Tailwind could be the place for you. Of all the airports that I have been associated with, either as a land owner or visitor, I believe that Tailwinds has the most conscientious management. It's nice to be at an airport where the owners take pride in their business and also create a friendly atmosphere to everyone there. I really appreciate that. Peaceful, well maintained, and spacious this Airpark makes the ideal home. Within driving distance of Dallas or Tyler, Texas or by air to anywhere (limited only by the amount of gas you can carry). There is a golf course nearby, if you are so inclined, or just enjoy the experience of having great neighbors. Tailwind Airpark is a great place to hold a balloon event and easy access to balloonist from all directions. The airport is a 360 degree flying area which is perfect for launching and flying for a long distance without problems. The North Texas Ballooning Assoc. would love to have a balloon event there sometime in the early fall. Oops! Something went wrong while submitting the form. Please try again, but if the issue persists, please email us. Copyright ©2018 Tailwind Airpark - All rights reserved.